The 200th anniversary of the Great Gale in Rhode Island is September 23, and the Rhode Island Historical Society (RIHS) is partnering with Historic New England (HNE) for two events this month leading up to the bicentennial. On a Saturday morning in 1815, 11-foot-plus storm surges blasted the coast of Rhode Island, driven by what experts believe was a Category 4 hurricane originating in the West Indies and making landfall in New England. Scores of ships and hundreds of buildings were destroyed, and the Providence waterfront itself suffered rampant damage amounting to an estimated quarter of the city&apos;s total valuation at the time. Although few lives were lost in Rhode Island, a total of 38 New Englanders are reported to have died in the storm. On Wednesday, Sept. 16, at 6:30 p.m., Brown University Curator and Senior Lecturer in American Studies Robert P. Emlen presents "Remembering the Great Gale" at the RIHS&apos;s Aldrich House headquarters. Tickets are $5 for RIHS and Historic New England members with code 86Y-6HF-Q88; $10 for nonmembers. Advance purchase is required here or by calling (401) 728-9696. 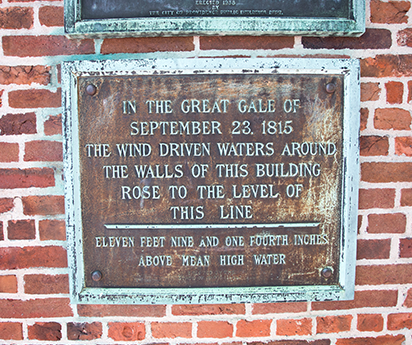 Then, on Saturday, Sept. 19, at 3 p.m., RIHS Tourism Services Manager Barbara Barnes and HNE Regional Site Manager for Southern New England Dan Santos will lead a tour visiting the very places in Providence that bore the impact of the Great Gale. 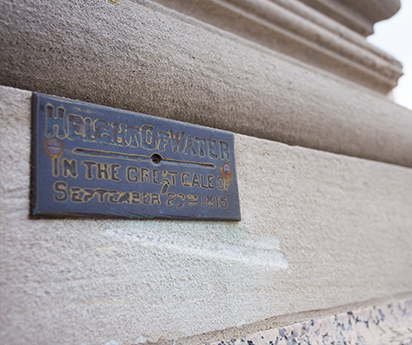 This special event, one of the true highlights of our walking tour season this year, will take participants back in time to a major moment in Rhode Island history. Tickets are $10, and registration is required by emailing bbarnes@rihs.org or by calling (401) 273-7507 x2.